Background: Familiarizing with the anatomy is a key to success groin hernia repair. Methods: We introduced an innovative training in soft cadaver of which surgical anatomy, dissecting plane and vital structures were provided. 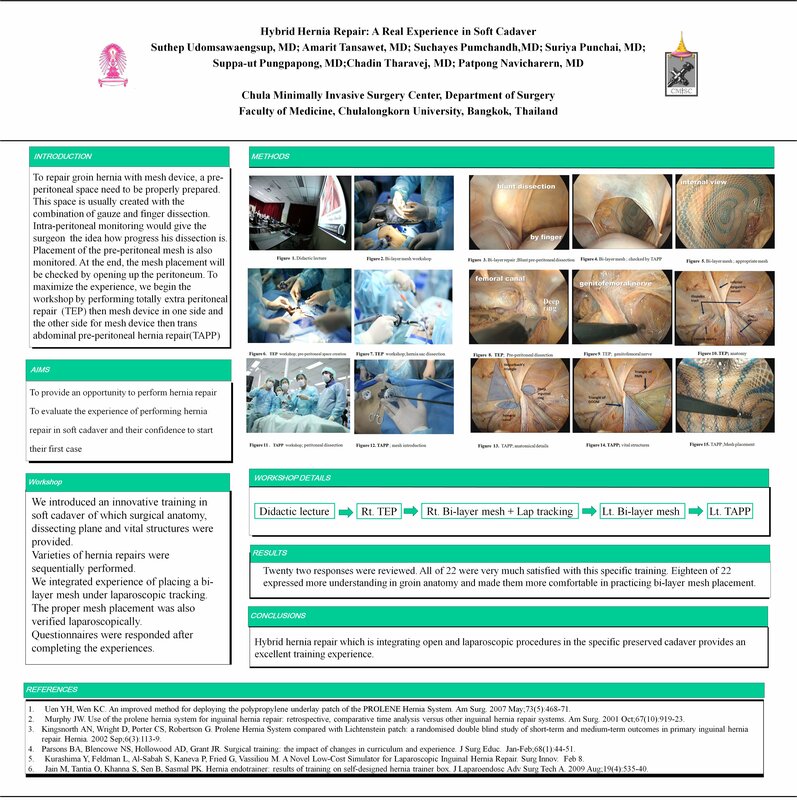 Varieties of hernia repairs were sequentially performed. We integrated experience of placing a bi-layer mesh under laparoscopic tracking. The proper mesh placement was also verified laparoscopically. Questionnaires were responded after completing the experiences. Results: Sixteen surgeons and 16 in-training surgical residents were included into this 2-day, hands-on workshop. Twenty two responses were reviewed. All of 22 were very much satisfied with this specific training. Eighteen of 22 expressed more understanding in groin anatomy and made them more comfortable in practicing bi-layer mesh placement. Conclusion: Hybrid hernia repair which is integrating open and laparoscopic procedures in the specific preserved cadaver provides an excellent training experience.